Swift School Of Pharmacy, Rajpura is a Co-educational Pharmacy Institution which is committed to innovative learning methodologies and cultivation of practical skills while adhering a academic quality. The Institute offers B.Pharmacy, which is a 4 year ( 8 semesters) course. The course is approved by Govt. of Punjab, AICTE/PCI, New Delhi and affiliated to I. K. Gujral Punjab Technical University, Jalandhar The B. Pharm degree mainly prepares the candidates to work in the pharmaceutical industry. 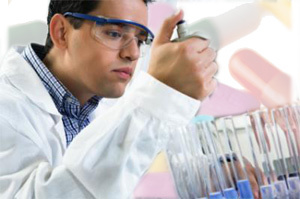 The course structure of the degree includes practical training in the pharmaceutical industry environment. A pharmacist having a B.Pharm degree is also eligible to practice pharmacy in a community or hospital pharmacy. Thus a pharmacy graduate can play an important role in Health-system Pharmacist or Hospital Pharmacist or Community Pharmacist , Production & Manufacturing, Research & Development, Analysis & Testing, Marketing, Hospital Pharmacy, Community Pharmacy, Academics, Regulatory Affairs ,Documentation, Library Information Services & Pharma. Journalism and Consultancy . Every day, millions of people walk into drug stores and depend on pharmacists for assistance and advice for their health care needs. A pharmacist is a person whose advise is solicited in matters of health and medicines. With growing number of pharmaceuticals companies in India, the demand for pharmacists has also increased making pharmacy a popular choice amongs students. 2. Pharmacy Council of India,New Delhi. Swift School of Pharmacy is a co-education Institute which is committed to innovative methocologies and cultivation of practical skills adhering to academic quality. The School runs a 4 year degree program in pharmacy (B.Pharm) and 2 year post graduate degree program in Pharmacy(M.Pharmacy) which are approved by the Govt. of Punjab, AICTE/PCI and affiliated to PTU, Jalandhar. The school is promoted by the leading pharmaceutical group, Ind-Swift Ltd. based at chandigarh.